Drawing, Portrait of John Birdsall. Courtesy of Texas Law. Image available on the Internet and included in accordance with Title 17 U.S.C. Section 107. BIRDSALL, JOHN (1802–1839). 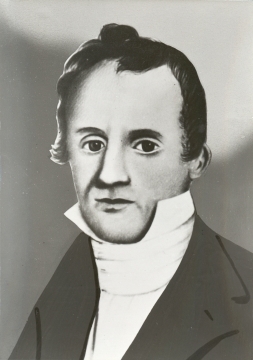 John Birdsall, judge and attorney general in the Republic of Texas, son of Maurice and Ann (Pixley) Birdsall, was born in Greene, Chenango County, New York, in 1802. He received his legal training in New York and was appointed circuit court judge of the Eighth District by New York governor DeWitt Clinton. Birdsall served in the New York Senate in 1832 and 1833. In 1837 he moved to Texas and became the law partner of Thomas J. Gazley in Houston. President Sam Houston appointed Birdsall attorney general of the Republic of Texas on August 15, 1837, and the Senate of the Second Congress unanimously confirmed him. Houston then appointed Birdsall chief justice pro tempore as successor to James Collinsworth. He served briefly, but the Senate refused to confirm him in this post. On January 8, 1839, he became the law partner of Sam Houston. The partnership lasted until Birdsall's death. Birdsall was a charter member of the Philosophical Society of Texas. He and his first wife, Ann (Whiteside), had two sons. In 1836 Birdsall married Sarah Peacock. He died of yellow fever on July 22, 1839, and was buried in Glendale Cemetery, Harrisburg (now Houston). George A. Birdsall, The Birdsall Family (Annandale, Virginia, 1958; rev. ed. 1964). Amelia W. Williams and Eugene C. Barker, eds., The Writings of Sam Houston, 1813–1863 (8 vols., Austin: University of Texas Press, 1938–43; rpt., Austin and New York: Pemberton Press, 1970). E. W. Winkler, ed., Secret Journals of the Senate, Republic of Texas (Austin, 1911). Andrew White Young, History of Chautauqua County (New York, 1875). Handbook of Texas Online, Edward C. Breitenkamp, "BIRDSALL, JOHN," accessed April 23, 2019, http://www.tshaonline.org/handbook/online/articles/fbi18.